We just ended a series on the “Parable of a loving Father” a few weeks ago in which we saw the Pharisees and Scribes writing the ending of the story by crucifying Jesus Christ on the cross. However if you were to read Isaiah 53:10 as we just did, then we read that it was the will of the Lord to crush Him, so how can we blame the Pharisees. I did a sermon on Easter Friday morning where we dealt with that. The question we asked then was ‘who killed Jesus? The conclusion is that the Romans put Him on the cross, the Jews put Him on the cross, our sins put Him on the cross, the Father put Him on the cross and Jesus put himself on the cross as He laid down His life for our sins. Now, a statement like this flies against the greatest commandment given by Jesus Himself in Mark 12:30 (ESV) “30 And you shall love the Lord your God with all your heart and with all your soul and with all your mind and with all your strength.’ So, if you are a Christian you should love God and I don’t think any of us have a problem with that. But can we really love the Father if it was His will to crush Jesus? I know many Christians who struggle with this. Such difficulty comes about because we have humanised God to our level, and we judge Him as if He is part of this world. The truth however is that if I love God with all my heart, nothing should make me gladder than when the cause of God prospers and when the name of God is the boast of more and more hearts and more and more people. And nothing should trouble me more than when the glory of God is cheapened and the name of God is despised, in the way that John Dominic Crossan does it. In other words, when Jesus commands us to love God with all our heart and soul and mind and strength, he is commanding us to have a radically God-centred heart and a radically God-centred soul and a radically God-centred mind and radically God-centred strength. And God-centred people are always troubled by the eclipse of God's glory, and they rejoice when it shines forth in full strength. So, when we deal with a difficult text like Isaiah 53:10 it has to be understood, instead of just read at face value and jumping to humanistic conclusions based on life on earth now instead of eternal heavenly realities. Earlier in the service we sang the song ‘above all power’ and in it we sang a line namely ‘He thought of me above all’. Wow, what a statement. Now, some Christians have a problem with that statement in their desire to be God centred, and I understand the root of their problem, because surely we don’t want to come over man-centred, as if I am so important that God would think of me above all. But, Isaiah 53:10 says that it was the ‘will of God to crush His Son’, other translations say ‘it pleased God to crush His Son’. Did God think so highly of us, that He would send His Son to die for us? Personally I abhor the often made statement that ‘if I was the only person alive God loves me so much that He would have sent His Son to die for me’. We cannot debate ‘if’s’, we can only deal with the realities before us. Is this not what we saw in the Parable of a loving Father that God the Father virtually casts off all restraint in his exuberance over the salvation of people and that he takes so much pleasure in our salvation that He will ‘exult over us with loud singing’. Now for me as a God-centred person, Isaiah 53:10, Zephaniah 3:17, the song that says: “He thought of me above all” is all troubling, but for a different reason. Let’s for a moment forget about the Pharisees and Scribes and let us focus on ourselves for a moment. Whether you are the older brother or the younger brother in the series we just looked at, or whether you are somewhere in between, isn’t God’s glory supposed to be so extreme, so marvellous, so wonderful and so exultational that God, to be God should actually NOT ‘exult over us with loud singing’. Think about it. Romans 3:23 (ESV) says: “23 for all have sinned and fall short of the glory of God,…” By nature we have exchanged the Glory of God for created things and we desire the things of God much more than the God of the things. By nature we prefer darkness to light. Do we really stand in awe of God to the point that God should ‘exult over us with singing?’ Is there any reason that God should exult over me? Now, by the way, the aim of my sermon today is not to confuse you or to align myself with the Pharisees who says that God should not eat with sinners. Remember their very issue was self-glory, and their hypocritical view of God. For them God should ‘exult over them’, but not over sinners. My concern is this: ‘why should God exult over any of us’? Why should the Father party, or sing over anybody in the spectrum of the younger son to the older son, wherever we find ourselves in the big picture. The aim of my sermon is that we will be brought to gratitude this morning, as we consider the death of Christ on the cross. I know that all of us, and I mean it, all of us even though we belong to God, even though we have been made God’s own even though we call ourselves Christians, we often bring disgrace upon his name by our inconsistency and half-hearted response to Jesus' command to love God with their whole heart. Isn’t that true? So the troubling thing for me today is that God is so enthusiastic about being good to a people whose sinfulness is a blight on His name. It seems schizophrenic in a sense, because the Bible makes God out to love his name and his glory with omnipotent energy and unbounded joy. And then the same Bible pictures God rejoicing over us, who so easily drop Him, and so easily do not love Him as we ought to with loud singing over people who have despised his glory and cheapened his name. So, we have a tension here and the question is, how do we resolve this tension? I believe the only way to resolve the tension, is to learn to live with the tension. It is to embrace the fact that redemptive history has two themes. One is the theme of God's passion to preserve and display his glory; and the other is the theme of God's unfathomable love for sinners who have scorned his glory. It is like a railway line. Both tracks have the same starting point, and run together through a landscape and both tracks have the same ending point. As a human we often sit on the one side of the train and when we look out of the window we only ever see the one track, but you know the other is there. But there is a station in history, where we get to see the big picture, and that big picture is seen in the cross. In other words. In the death of Jesus the two themes of God’s love for His glory and His love for sinners are resolved. 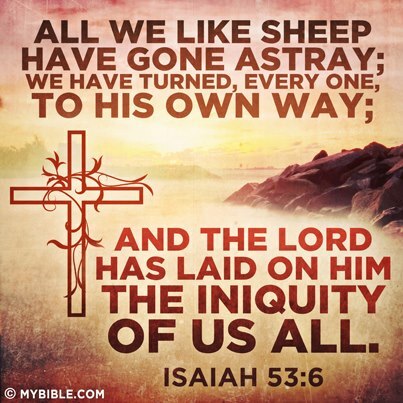 Isaiah 53 is simply a point on the journey to the cross where what is to come is revealed. So, what is revealed to Isaiah? Some translations used the word ‘pleased’ and ‘pleasure’ in the place of will, which in a real sense is more accurate. This is a prophecy and picture of Jesus Christ crucified and raised from the dead hundreds of years before it happens. The bruising is the crucifixion and death of Jesus, making himself an offering for sin. The prolonging of his days is a reference to his resurrection to eternal life after death. And when it says he will see his offspring, it means that the fruit of his suffering will be many people saved from sin and death. So what do we learn from this? The whole crucifixion was a work of God. Jesus was not simply swept away by the wrath of uncontrolled men. Even though the Pharisees from human perspective desire to kill Jesus and were the primary cause in the actions, we cannot ignore the fact that He was crushed by his Father. Why? To resolve the tension between the Father's love for his glory and his love for sinners. The very death of Christ was a demonstration of the Father’s love for His glory, because without it, His love for sinners would not be demonstrated and therefore His love for His own glory would not be demonstrated. Why? This brings us to our second pint. Notice two things. Again (as in verse 10) it is the Lord who is at work: "The Lord—God the Father—has laid on him . . . " And then notice that the issue is ‘iniquity’, which is just another word for sin. "The Lord has laid on him the iniquity of us all." The bruising of the Son was because God-dishonouring sin could not be ignored. And why couldn't it be ignored? Why couldn't God just let bygones be bygones? Because God loves the honour of his name, or in other words, the Father loves His glory. He will not and cannot act as though sin—which belittles his glory—didn't matter. I know this is a weak argument in its fullest essence, but it illustrates the reasoning here. It just falls down in its ultimate quality. Let’s say you love gardening, and your garden is your honour, in a sense your glory. So, you send your only beloved son, to work all day in the sun to pull out all the weeds, simply because you love your glory, and the very garden that displays your glory is full of sin called weeds and Brussel Sprouts, so it pleases you that your son would pull out all the weeds, even though he endures suffering to do so. And it pleases your son to pull out the weeds on your behalf, because he shares the love for your glory and he shares the love for the garden that reveals your glory. Geddit? The dishonouring weeds cannot be ignored, because you are the ignoring your glory. So, for God to ignore sin, He would be ignoring his glory, and the railway line we spoke about earlier will come to a sudden halt. We needed the station of the cross, as it is there that God’s love for His glory and God’s love for sinners meet. 3, There was a suffering that our sin deserved. In other words, it was not for his own sin that the Father bruised him. It was because he wanted to show us mercy. He wanted to forgive and heal and save and rejoice over us with loud singing. But he was righteous. That means his heart was filled with a love for the infinite worth of his own glory. And we were sinners, and that means that our hearts were filled with God-belittling affections. And so to save sinners and at the same time magnify the worth of his glory God lays our sin on Jesus and abandons him to the shame and slaughter of the cross. Back to our illustration of the garden. So, now God can walk in His garden and rejoice over it with singing as He beholds the completed work of His Son and rejoices in what He did. Again, this illustration falls in many places, and cannot be applied to all theology. For example, we know that sin, will still be with us till we are in glory. 4. But, how could It be the Father's delight? How could the Father find delight in the sacrifice of his own Son? One part of the answer must be what is stressed at the end of verse 10, namely, that God's pleasure is in what the Son accomplishes in dying. It says at the end of verse 10, "The will (or pleasure) of the Lord will prosper in his hand." I take that to mean that God's pleasure is not so much in the suffering of the Son considered in and of itself but in the great success of what the Son would accomplish in his dying. For example, in verse 10 there would be many spiritual offspring and the lengthening of the days of the Son—which clearly means resurrection from the dead and life beyond the grave. Let me get back to my garden illustration. So the anguish or travail of the son, brings satisfaction to the son. Why? Because He knows that by Him, and through Him, and for Him all things were created. So, He is an heir of all, and now many will be accounted righteousness in Him as we become joint heirs. So, now we are getting to the crux of the matter. Listen nicely. So, you and I now as joint heirs, understand that sin tarnishes the glory of God, and that the reason God loves us so much is because He loves His glory so much, so He cannot leave the garden of sin, then and now in tatters, and that His son, for whom it all was made is willing to die, so that God’s love for His glory and His love for sinners like you and me, who are created for His glory can be brought into harmony. This is the pleasure of God that prospers in the hand of the Son, and surely part of the reason why the Father is pleased to bruise the Son. 4.2 Because of the measure of God's love for His own glory. But I think another part of the answer must also be that the depth of the Son's suffering was the measure of his love for the Father's glory. It was the Father's righteous allegiance to his own name that made recompense for sin necessary. And so when the Son willingly took the suffering of that recompense on himself, every footfall on the way to Calvary echoed through the universe with this message: the glory of God is of infinite value! And so when the Father forsook the Son and handed him over to the curse of the cross and lifted not a finger to spare him pain, he had not ceased to love the Son. In that very moment when the Son was taking upon himself everything that God hates in us, and God was forsaking him to death, even then the Father knew that the measure of his Son's suffering was the depth of his Son's love for the Father's glory, and in that love the Father took deepest pleasure. In other words, when Jesus died, he glorified the Father's name and saved his Father's people. And does not the Father have pleasure in his name? And does he not rejoice over his people with loud singing? How then shall he not delight in the resolution of these two joys in the bruising of his Son? So, let me conclude with a few questions. Do you understand the Glory of God, and God’s intent, and His right to protect it? Do you understand that sin tarnishes that Glory? Do you understand that Christ’s view of the Father’s glory was so high that He was willing to die in the place of us as sinners, to restore that which eclipses the Father’s glory? Are you therefore willing this morning to recommit yourself, to living for His glory and doing everything in your power to eradicate that which tarnishes His glory and to do all you can in your power to display and defend that Glory. Why, because my friend? Ephesians 3:10 (ESV) 10 so that through the church the manifold wisdom (or glory) of God might now be made known to the rulers and authorities in the heavenly places." Ephesians 3:21 (ESV) “21 to him be glory in the church and in Christ Jesus throughout all generations, forever and ever."